During the 1950s, the town’s character underwent a change from that of a peaceful summer resort, to a bustling commuter town which became home to the Ford Motor Company and other businesses and commercial enterprises. Population growth and residential development transformed the town’s rural character. Although agriculture maintained a strong presence throughout the town - making use of the numerous fertile fields dispersed throughout Oakville - a downtown core began to take shape, making way for the booming economic development which would be soon to follow. Oak, pine, potash and later fruit were the bases of early commerce in Oakville. 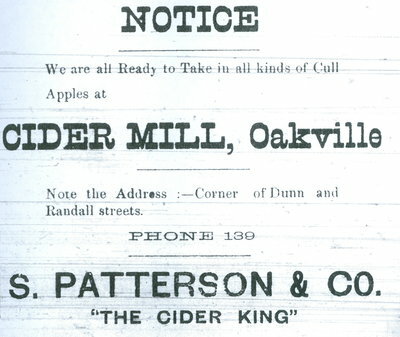 Fruit farming was of prime importance to the community of Oakville in the early 1900s. Apple, plum, cherry and pear trees were among the most popular, grown in orchards and in residents' back gardens. Vineyards were also numerous, as were fields of smaller fruits such as strawberries and raspberries. Oakville strawberries in particular, had earned a reputation for their superior quality and size. When a supply arrived in the city markets, vendors would announce their arrival by calling out to the people on the streets, and soon the demand exceeded the supply. 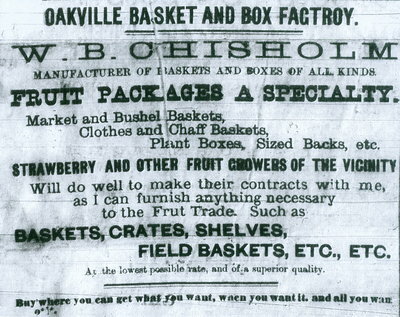 The birth of the Oakville Basket Company was the direct result of the need for suitable containers to hold large amounts of delicate and perishable fruits produced by Oakville’s farmers. In 1900, the factory was owned by the Freestone brothers and was located on the bank of the Sixteen Mile Creek. Within two hours of a log entering the veneering room, it would be turned out as a finished basket, two thousand of which were produced for strawberries each day and two hundred and fifty thousand produced for grapes each and every business day. The whistle of the Oakville Basket Factory was also a regular sound which could be heard in Oakville. In 1942, the Basket Factory whistle became the town's official fire alarm. Due to the excellent quality and copious amounts of local fruits and vegetables in Oakville, these foods took center stage while in season. 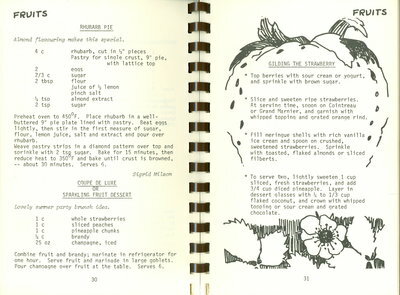 Many recipes featured fresh Oakville produce, especially strawberries. Some local recipes are displayed to the left. Patterson’s Cider Mill perfumed the autumn air with their cider processing. They were located on Dunn Street. 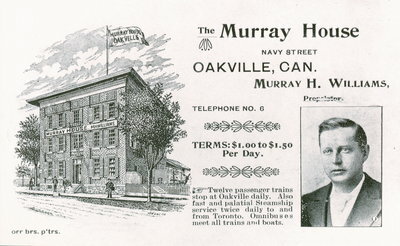 Until the arrival of the railroad in 1855, the existing hotel accommodations in Oakville were sufficient to cope with stage and steamer passengers. 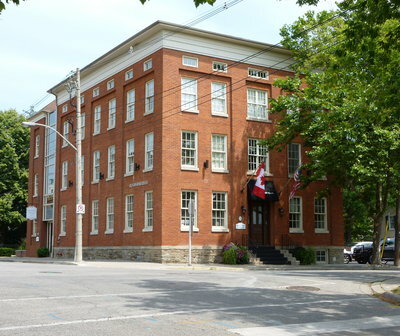 It was in December of 1857 that John Williams opened the 21 bedroom, 4 parlor Canadian Hotel on the corner of Robinson and Navy Streets, and it quickly became a favorite place to stay in Oakville. It was sold to James Teetor for around $2000 in 1867. It changed hands once more when James Taylor, a local harness maker, bought the hotel in 1886. He operated the hotel during the prohibition period in Oakville. In 1896, Murray Williams purchased the hotel and gave it his name. He had much experience as a hotel and tavern keeper, also owning and operating the Oakville House. 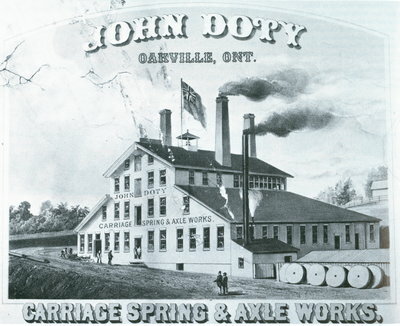 John Doty, a machinist who came to Oakville from New York, went into partnership with another man by the name of Abiather Ashley Hibberd, and in 1851, built a foundry on the west bank of the Sixteen to manufacture steam engines. The foundry burned down in 1854, at which time it was rebuilt, but under a new partnership between Doty and R.K. Chisholm, who together founded John Doty & Company. As the use of the automobile increased, manufacturing of carriages decreased in turn. A.&G. 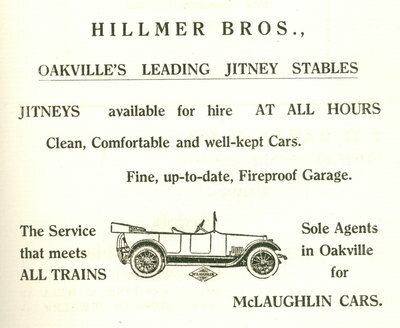 Hillmer's Livery Service also followed this trend, replacing their horse and carriage ensembles with motor-buses and Model T Ford taxis or 'jitneys' in 1914. 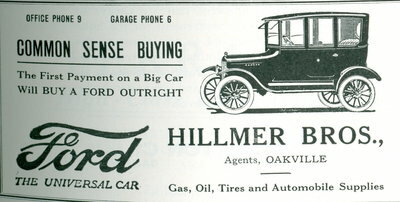 They also expanded into automobile sales and service for McLaughlin motor car, and later the Model T Ford, as shown in their advertisements to the left. In addition to their booming automobile businesses and services, they also operated a fuel and ice company. These commodities were of great importance to the people of Oakville. Coal arrived by boat and was piled alongside the east bank of the river, while large chunks of ice were cut out of the Sixteen in the winter, as well as brought in from Lake Simcoe, and stored in cold cellars. In 1951, the Ford Motor Company acquired a 410-acre site on which it built a car assembly plant. The plant produced Fords, Meteors, Monarchs and Mercurys. It was also responsible for attracting other industries in its wake, bringing further prosperity to Oakville. Wm. Whitaker & Sons had a garage on the west side of Trafalgar Rd., just south of Church Street. They originally made wagons and carriages but entered into the 'horseless carriage' field in the early 1920s in order to keep up with the competition. The information on this page is credited to: Ahern, Frances Robin. Oakville: A small town (1900-1930). Erin, On: Oakville Historical Society in association with Boston Mills Press, 1981. Print. and to: McKeon, Clare, and Joseph McKeon. Oakville: A place of some importance. Burlington, On: Windsor Publications (Canada) Ltd., 1986. Print. and to: Peacock, David, and Suzanne Peacock. Old Oakville. Willowdale, On: White/Hounslow Productions, 1979. Print.